Have you ever thought that you have too much stuff? Maybe you've imagined how liberating it must feel to downsize on the things you own and move somewhere new. That is exactly what the artist Natasha Lawyer and her husband Brett Bashaw have decided to do. 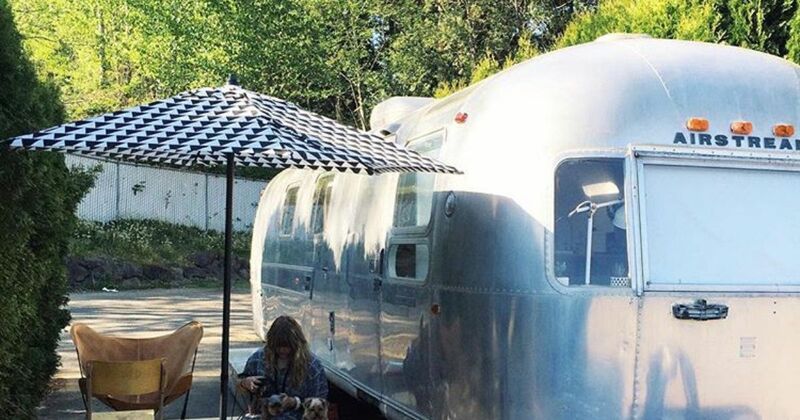 Recently the couple has streamlined their lives by deciding to renovate a vintage airstream and making it their home in Seattle, Washington. They call their new home the Tin Can Homestead and you can follow their Airstream adventures on their Instagram. Natasha's years of experience as an artist and designer really show through all of the details of this camper's interior. Allowing the natural qualities of the surfaces and materials to speak for themselves, the couple accentuates the interior with pottery and items from their travels. The Airstream is filled with as many potted plants as possible, contrasting the white walls and minimal design, and bringing the space to life. The Tin Can's living room windows open out into the landscape. The large day bed is the perfect place to take a nap and bask in the afternoon sun. Their two Yorkies seem to enjoy it. The kitchen space is clean and functional, making smart use of the walls for extra storage space. White walls, light wood, and gold fixtures reflect the abundant light that enters the Airstream from all sides. The couple has picked out the perfect tiles for their kitchen's backsplash. It seems like every nook of this Airstream is filled with pieces of art and beautiful plants. Even the quaint bathroom has some green in it. The plants that they couldn't fit inside their home were brought outside to their front patio and container garden. ... or perhaps after a long day of renovation, the couple just wants to kick back in bed with their fur babies. Airstream life has never looked more delicious. SHARE this article if you're feeling inspired to give it a shot yourself!